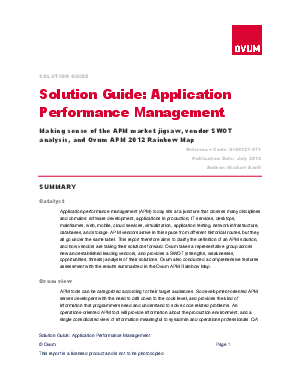 > OpTier > Ovum Research: Solution Guide - Application Performance Mgmt. Learn from Michael Azoff of Ovum how application performance management (APM) today sits at a juncture that crosses many disciplines and domains: software development, applications in production, IT services, desktops, mainframes, Web, mobile, cloud services, virtualization, application testing, network infrastructure, databases, and storage. This report aims to clarify what it is that defines an APM solution, and how the vendors are taking their solutions forward. Ovum takes a representative group, across new to established leading vendors and provides a Strengths Weaknesses Opportunities Threats (SWOT) analysis of their solutions, and conducted a comprehensive features assessment with the results summarized in the Ovum APM Rainbow Map. Ovum's recommendation is to shortlist OpTier where a single APM solution is required to complement existing monitoring tools for cross-silo transaction visibility or replace some of the more traditional APM tools.